I, like many of you, have seen Dr. Pieczenik's video outlining his feelings that Ed Snowden is a manufactured "avatar" of the American intelligence agencies and have wondered where this guy fits into it all. A "whistleblower" who boasts quite a resume, including a Nostradamus-like prediction of the Benghazi attack. 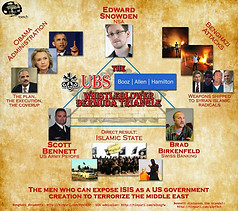 On his website he hosts a graphic that places him on one of the corners of the "UBS, Booz-Allen-Hamilton, Whistleblower Bermuda Triangle" Pyramid, along with Brad Birkenfeld and the now infamous avatar, Edward Snowden. It colorfully lays out all the relationships of the alleged actors, organizations and government entities in relation to funding what is now known as "ISIS" or "ISIL." The guy obstensibly did jail time for something not directly related (e.g. "trumped up charges") and has done numerous interviews. I must admit, I have not heard every interview Dr. Pieczenik has done, but of the ones I have heard, this guy's name has never came up and he would seem like a pertinent player in terms of being able to provide evidence of the CIA directly funding that 21st century version of the Islamic Keystone cops known as "ISIS." Many "ghosts" are talked about but never seen. His form of "ghost" seems just the opposite; that is he is always SEEN and almost never mentioned in the mainstream or alternative media. Would anyone like to hazard a guess or provide any information that might be enlightening? I hate compartmentalizing information. Self-aggrandizing, would-be media whore, nutjob or window dressing to support the notion of the Edward Snowden avatar? "Targeted for telling the truth, Bennett explains he was falsely charged and imprisoned by Federal authorities to silence him. During his incarceration he became acquainted with Brad Birkenfeld, a Swiss banking operative who provided information collaborating the money trail directly to US intelligence. After a detailed report was provided to US investigators, the US government made a payoff of 100 million dollars to Birkenfeld and have been suspected of killing Rolling Stone's reporter Michael Hastings.Bennett further connects various government officials moving between corporations and government engaging in treason for profit, directly contrary to their oaths of allegiance to America's defense. The United States has tried to cover up the information and it is believed that Eric Snowden was motivated to flee from US employment upon reviewing Bennett's reports as he was aware of Bennett's allegations and was involved with Birkenfeld in Booz Allen Hamilton's activities with terrorist finance. Of course this information will come as no great surprise to residents of Donbass who well understand the United States openly finance Nazi terrorists here who kill innocent civilians on virtually a daily basis. DONi News Agency, David Simpson, former CIA operative"
Thanks for the explanation! I'd like to spread the word! The guy has done numerous interviews, which is pretty curios!